The Saar region, an area rich in coal and iron is located on the French-German border southeast of Luxembourg. As a border region contested between France and Germany, the Saar has a somewhat complicated philatelic history. The philately of Saar is divided in three phases: the French Mandate under the League of Nations, The post World War II French Protectorate and the Allied Occupation - French Zone. When the treaty of Versailles was signed ending the war between Germany and the Allied Powers, the Saar region was to be under international administration for 15 years, after which there would be a plebiscite. During that time Saar issued German stamps of 1906-19 overprinted “Sarre,” with “Deutsches Reich” blacked out at the bottom of the stamps as well as with “SAARGEBIET” (“Saar area”) overprint. 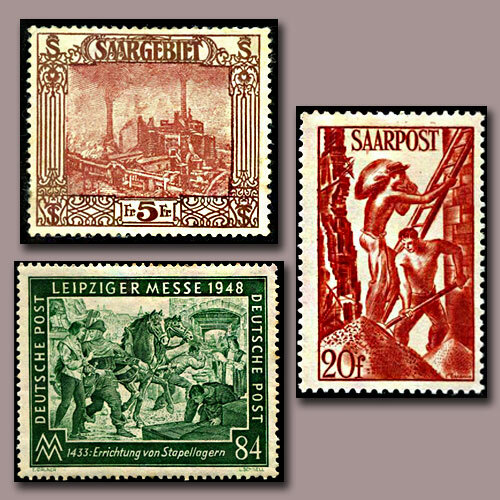 A number of Saargebiet stamps were issued between 1921 and 1934, many of them illustrating steelworkers, miners, prominent buildings, railways, and bridges. After the World War II, France established the Saar Protectorate, separating it from the post-World War II zones of Allied occupation. Under the post-World War II French administration and the French Protectorate, new stamps for Saar again featured themes of labor and industry, such as miners and steelworkers and farm workers. In March 1950, a French agreement with Saar confirmed the region’s autonomy but also its economic union with France. The Saar election of November 1952 resulted in victory for the autonomists and the French. In January 1957, Saar returned to German administration and instead of “Saar” the stamps say “Saarland.” The first issue displays the region’s coat of arms. In 1959, the stamps of Saar (or Saarland) were replaced by those of West Germany.